Here is a recipe for the granola bars I made for my packed lunches this week. 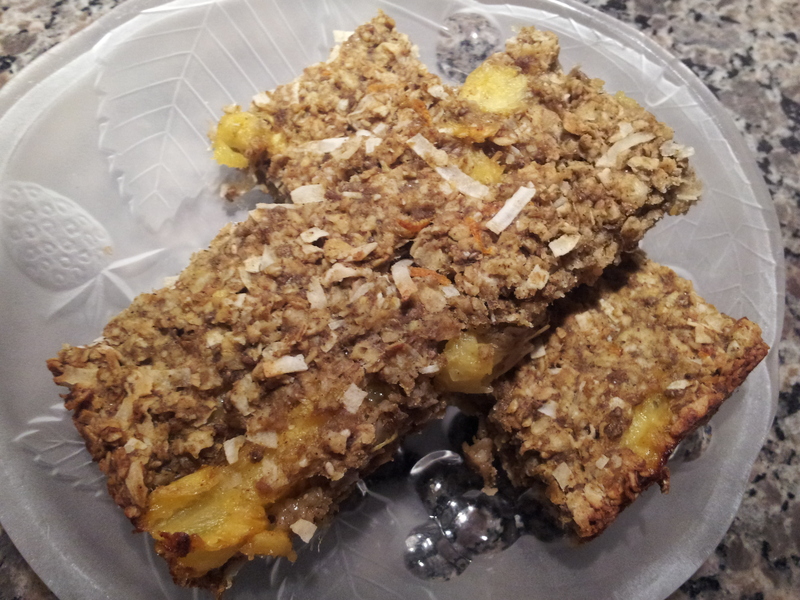 Every couple weeks I experiment with new flavours of granola bars, and this week I had pineapple on hand. This is a snack to bring a little bit of tropical sunshine during these cold winter days. I preheated the oven to 350*F. In a small bowl I let the chia seeds soak in the orange juice for about 5 minutes. While I was waiting I mashed the bananas, then added the orange zest, pineapple, vanilla, maple syrup, and melted coconut oil. In a large bowl I combined the dry ingredients, then added them to the wet ingredients. The mixture should be moist but not wet, and firm but not dry. Add more oats or water as needed. I pressed the mixture into an 8×8 pan that was lined with parchment paper, and baked them for 35 minutes. I usually bake granola bars for 25 minutes, but these had more moisture, so they needed more time. The edges of the cooked batter were golden and when I touched the top, it was hard but slightly spongy. I cut the granola bars into 10 pieces using a sharp knife after the pan cooled down completely. I stored them in the fridge so they would last longer. On the counter they would probably last 5-6 days. In the fridge they can last over a week, maybe two weeks. They can be frozen too. I bet adding almonds and swapping almond extract for vanilla would be quite scrumptious. My dad spread cream cheese on top and ate them for dessert.